We look at ways to reduce the impact of noise on your home life this summer and have invited Everest to tell us about their new sound reducing acoustic glass. Ah summer. Weekends spent in the garden. Barbecues with friends. Late night al fresco dinners. What’s not to love? In short, the noise. Whether it’s a neighbour’s dog, someone mowing, building work or traffic, noise can be a real nuisance. We take a look at how you can reduce the impact of external noise inside your home and outside in the garden. What’s wrong with a little noise? New research from Everest reveals that just under half of Brits (46%) are woken or kept awake at least once a week by noise from outside their home, with those affected being disrupted on average 70 nights a year. As well as losing sleep, there’s a significant knock-on effect on how people feel the next day, which can have a detrimental impact on their overall sense of well-being. Those affected report having less energy the next day (37%), being in a bad mood (30%), and being less patient (29%). Furthermore, they admit to becoming annoyed more easily (29%) and are less productive (24%). Despite it’s impact on us, less than a third (32%) would ask those creating a disturbance to be quiet if the noise was disturbing them. Those disrupted by external noises to their home have resorted to wearing earplugs (16%), turning their TV or radio up (13%) and one in ten (10%) have upgraded their windows to combat noise. One of the most annoying things about summer is when neighbours have summer parties or barbecues with loud music and chatter that seems to fill your house even when you’re inside with the windows closed. Everest have a solution. Their new laminated Acoustic glass has a polymer layer between the panes of glass, specifically engineered to disrupt and absorb sound waves and reduce noise pollution. In addition to its sound-reducing qualities, it has A+ rated thermal performance and is highly secure as the lamination process means the glass is virtually impossible to break. Whatever the noise, whether from a road or neighbours, try to create a barrier. A man-made barrier, such as a masonry wall or a solid fence, is apparently more effective at blocking noise than planting a hedge or row of tress. But if you can do both without taking up too much of your garden then mores the better, as a high hedge will act to further muffle the noise. Evergreen tress and hedging are the best option as they’ll provide year long noise protection! Why not distract yourself with other noises? A water feature can provide a pleasant distraction, masking other sounds and at the very least muffling next doors’ conversation. The sound of water can also be extremely relaxing. Remember to be a considerate neighbour yourself. If you’re thinking of mowing the lawn or doing noisy DIY, don’t start too early or go on too late. If you end up having an impromptu garden party try to avoid loud music, move the party indoors at a reasonable hour and finish at a decent time. And of course, it doesn’t hurt to do the neighbourly thing and extend the invite their way! 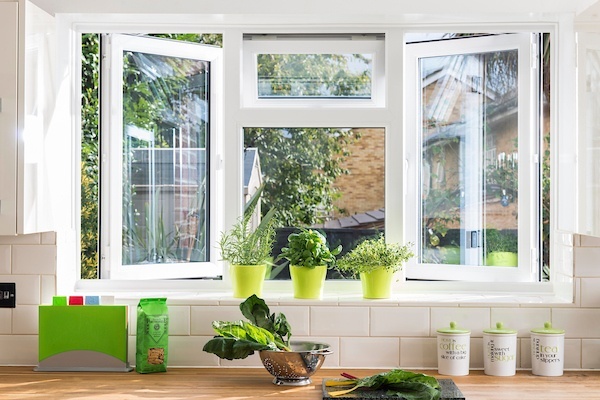 Everest are offering up to 45% off Windows and Doors, with free upgrade to SmartLock and 20% off conservatories, with free upgrade to Triple Glazing. Click on the image for more details.